This is a recipe based off the Italian flatbread piadina, which is a specialty of Romagna and is essentially an Italian flour tortilla. What I’ve done is sub in some acorn flour for the wheat flour; the acorn flour makes the breads dark and nutty. If you don’t have acorn flour, chestnut flour is an excellent substitute. You really want that nutty flavor, but don’t think adding more acorn flour would be better here, though. 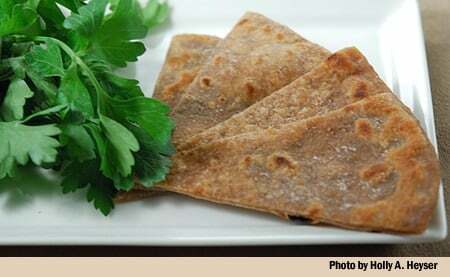 Acorn flour has no gluten and so will simply disintegrate if you try to make an acorn-only piadina. Most Old World cultures that use acorns – Spain, Italy and North Africa primarily – use them as a “filler” when wheat flour is scarce. I just like the taste and want to include wild starches in my diet. Could that flat bread be a good substitute for pizza pie crust? Mike: Maybe? Never tried it.